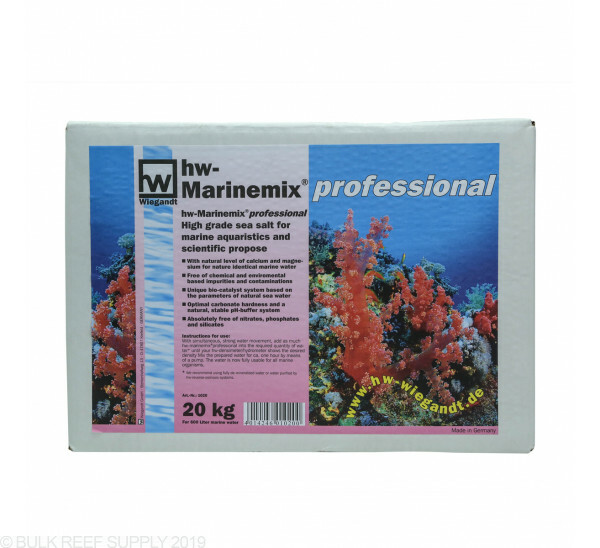 HW-Marinemix Professional Salt Mix is a high purity blend of salt mix produced using the synthetic process and does not contain any recycled components. Uses high-grade materials to match natural seawater while providing natural calcium and magnesium concentrations to match natural seawater. hw-Marinemix is produced under strict quality control guidelines using a biocatalyst system based on the analysis of natural seawater. BRS recommends using a complete salt mix, to save money and time on testing supplies and major element adjustments. I was using the Reefer HW mix in my FOWLR tank until this came out. Best salt there is for a FOWLR tank, no question. A bit expensive, but you're paying for quality. I have used many brands of salt this is by far the best so far . My corals thrive , it mixes thoroughly and disolves fast . I'll never go back to any of the others. I too originally purchased this because the Reefer style of salt was our of stock. I think this salt should only be used in a FOWLR system. I have been using this salt for about 4-5 months and coral growth is not happening. Everything is happy in the tank just very very slow growth. So while I think it is a great salt for a fish only system and it mixes well it should be avoided for reef systems. I was going to switch to the "reefer" style but since I can only get it from BRS then I changed to reef crystals and if that doesn't work I will go to Red Sea Coral Pro. 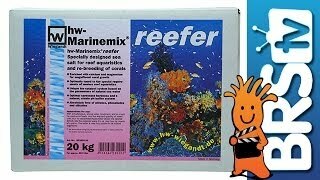 Happy reefing! I recently started a new 75 gallon in wall reef tank and wanted to use a new salt that I haven't used before. Glad I chose this salt mix my reef inhabitants couldn't;t be happier. Int the past I used IO and had a hard time maintaining consistent results. I got this mix instead of the reefer, because they were sold out. I thought it being a HW product it was the same! I WAS WRONG!!!! This mix will not mix clear! It leaves a white pasty residue in the mixing tank, and all over the powerhead and heater. Also there are undisolved solids on the bottom of the container. Very disappointed with this! I would buy the reefer only from now on!!! 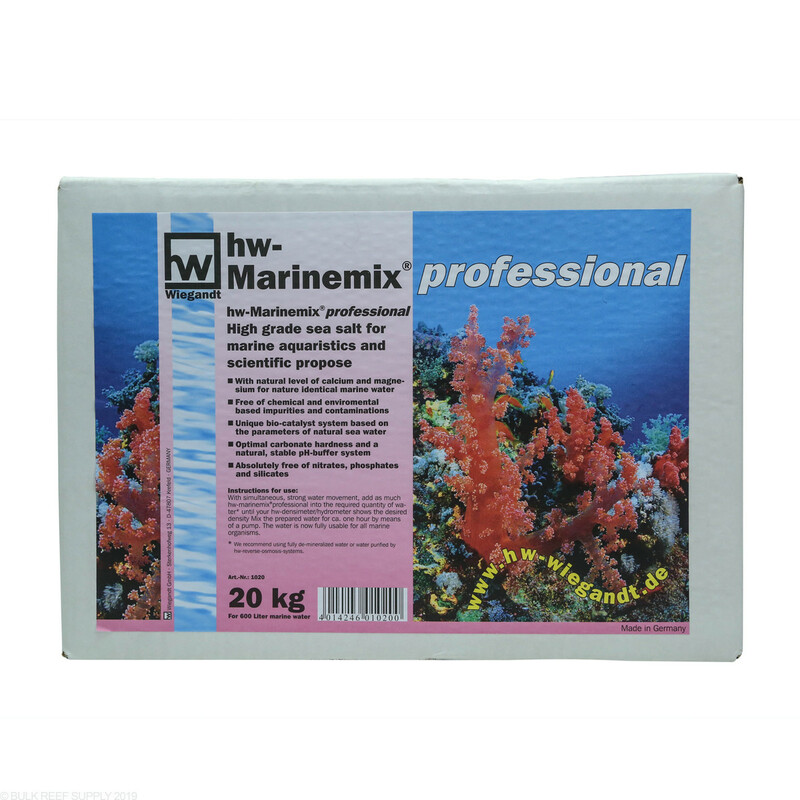 I like this hw Marinemix professional and all the elements are exactly in the range I prefer for a marine aquarium. I can see why BRS recommends this over other salts. It's worth the price because I am particularly picky when it comes to what I use for breeding my clownfish . I would use their other salt for a reef. I wrote the manufacturer and Annette Bell sent this response, so I posted it here in case anyone needs the element values on this professional hw-Marinemix. Its always good to test any salt you buy to make sure its giving you the values you want, but don't forget to have your salinity at the recommended level when testing. I received this product the other day. I mixed it up to a salinity of 1.024. There is a white filmy residue all over my mixing container and power head. Is this normal? Is it harmful to fish? It is very common for a white residue to form on the container and powerhead. This is precipitation and is not harmful and often can be washed off and dissolved into the salt mix. Feel free to let us know if you have any further questions! How much salt per gallon to reach 1.026? It will vary and you will want your refractometer to find the correct amount however typically it is around 1/2 cup per gallon. Feel free to let us know if you have any further questions!